If you’ve been thinking about a change in hairstyle or hair color, there are hundreds of different options. You might have an idea about what you want, but you’re not sure how to explain it to your stylist. There’s no need to worry – we have assembled a few tips from the pros that will help you tell your stylist exactly what you want! Bring in that picture. You might not find an exact match, but if you do, that’s great! If not, think about the different aspects of the style or color and see if you can find them in a picture online. You might want a certain color highlight and a certain cut, for example, but they might not be pictured on the same person. A picture is a very valuable way to communicate exactly the look you want. Know the terminology. If you can’t find a picture, try to find the term that describes the style you want. For example, an ombre color is dark at the top and light at the ends, haircuts can leave hard or soft lines, and a bob is type of short hairstyle. Be realistic. If something looks great on the actress in your favorite show, it may not look exactly the same on you. Your hair texture or color may be different, or your natural curl may make it difficult to pull off just the right look. Your hairstyle will be different from everyone else’s, so celebrate these differences and realize that your style will reflect your individuality. Talk about your lifestyle. How much time do you have to style your hair every morning? Do you want something that will look professional in the daytime that you can change up for a night out? Do you just want something with minimal upkeep? Be honest with your stylist about how you want to live in your new hairstyle. Talk about your history. Is this the first time you’ve ever colored your hair, or do you get a different color every year? 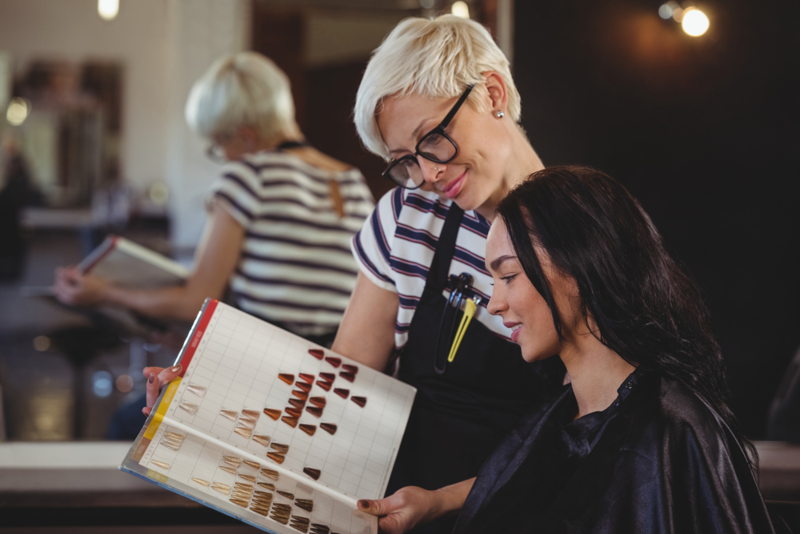 The amount of processing your hair has had in the past will affect what can be done for your current style, so share your hair’s history if you are starting with a new stylist. Dress the part. Go to your appointment wearing outfits you normally wear for work or out on the town so that your stylist can get a feel for your individual style. This will help your stylist make subtle adjustments to your color or style to best suit your personality. Are you ready for that new look? Make an appointment today at Meraki Hair & Makeup Studio. Our well-trained, professional stylists will help you get the perfect hairstyle or hair color for you! You can find us at 1281 Arthur Kill Road in Staten Island or call us at 718.966.6601. If you prefer, you can instantly schedule an appointment yourself on our mobile app. It’s available for a free download from iTunes or Google Play.